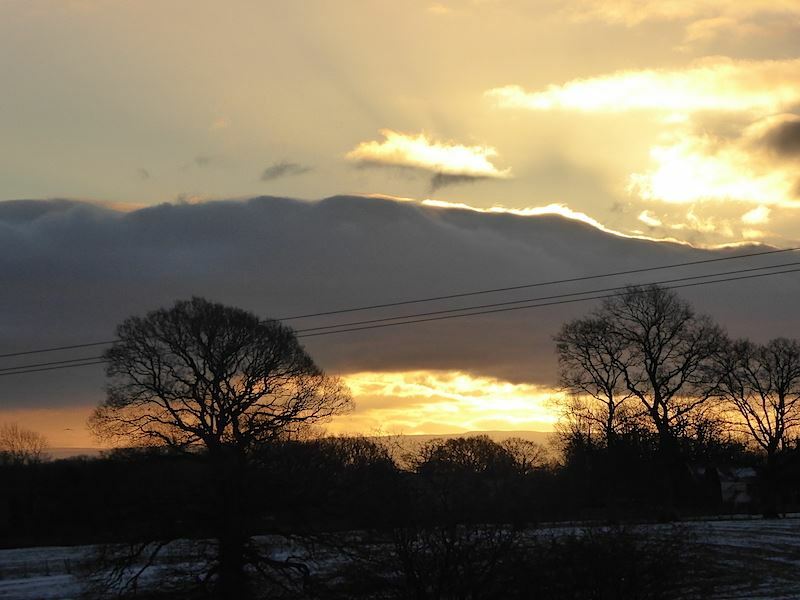 Sunrise across the fields behind the house. 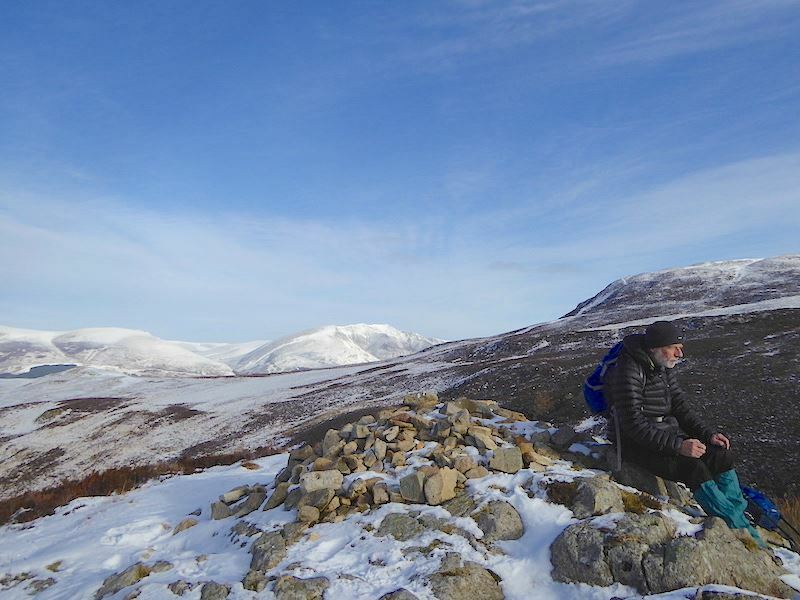 We were up early to take advantage of a blue sky and sunshine day that was forecasted, although the temperature would stay around the freezing mark all day. 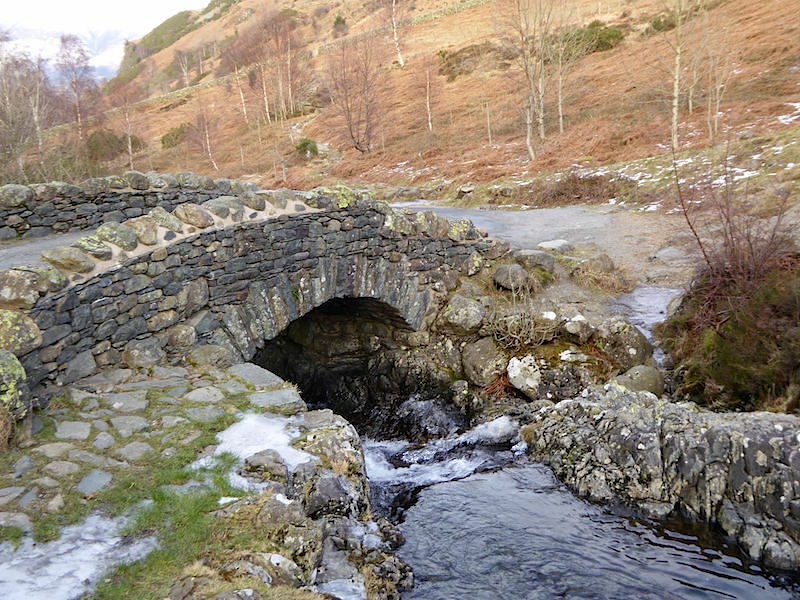 Off we went to Keswick and parked up at Ashness Bridge on the Watendlath road. The car park is the little open area just above the fence and we’re the only ones there at the moment. 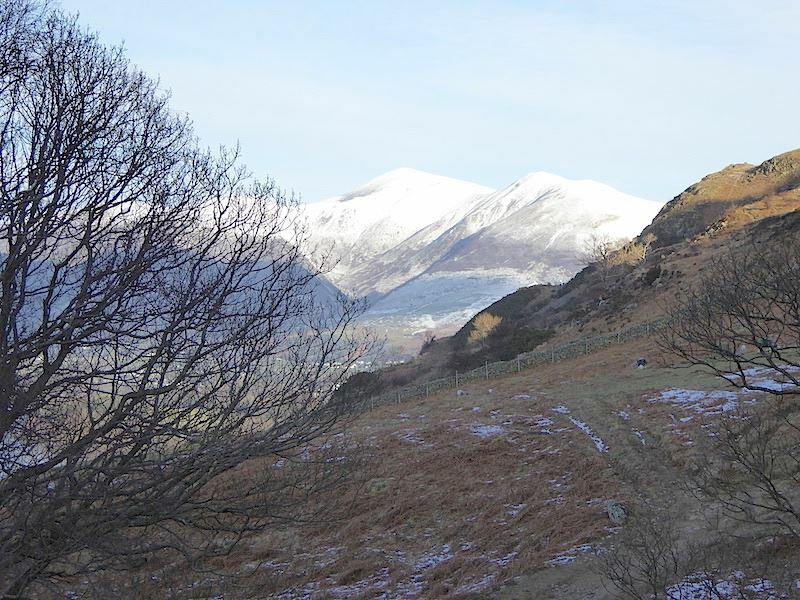 Snowy Skiddaw on our left as we make our way up the wet and slippery path. 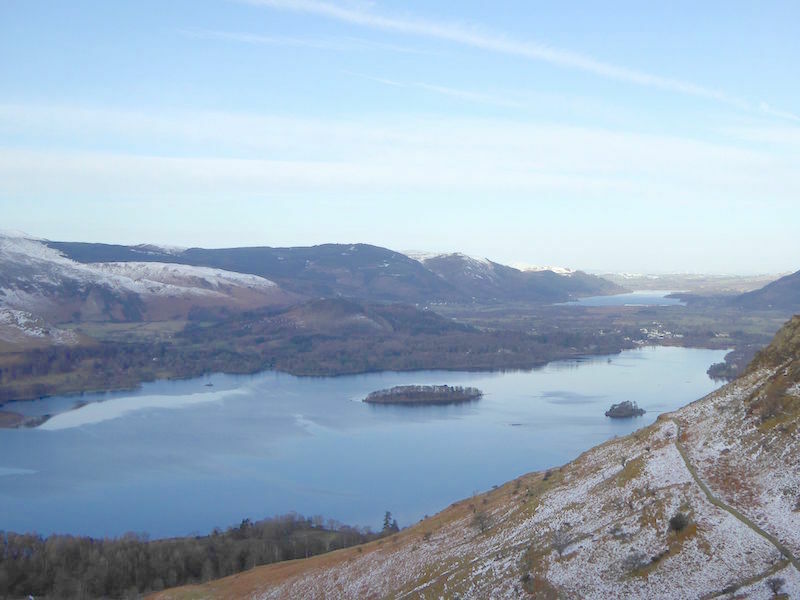 Tranquil Derwentwater and Bass Lake beyond it. 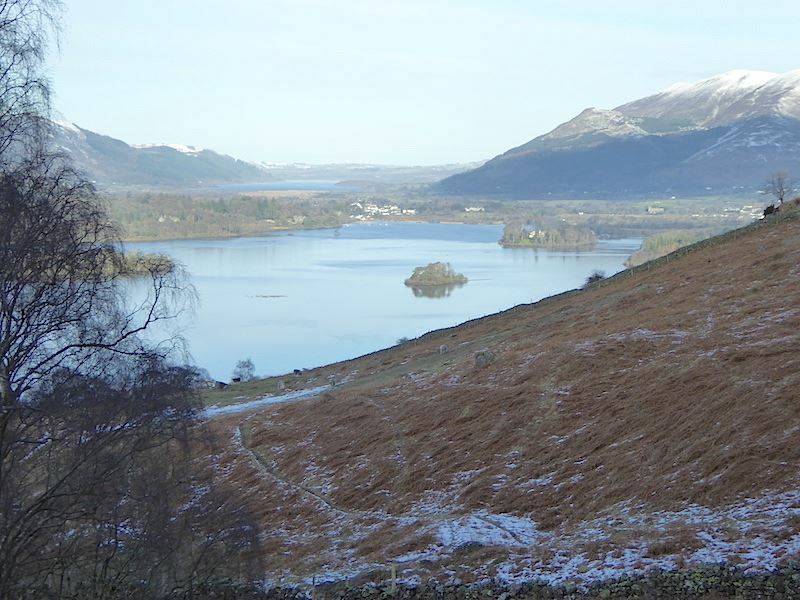 Derwentwater looks to have a thin film of ice over it this morning. 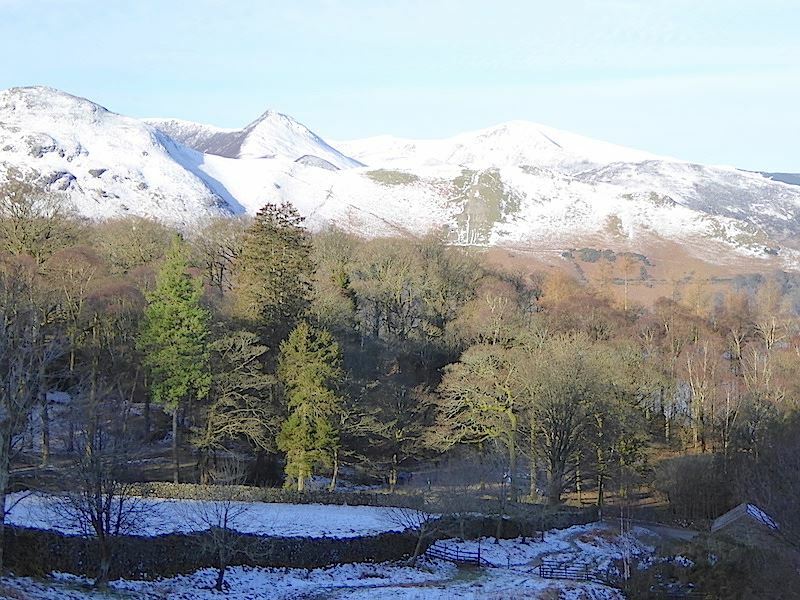 Across the valley from us is the High Spy – Maiden Moor ridge. 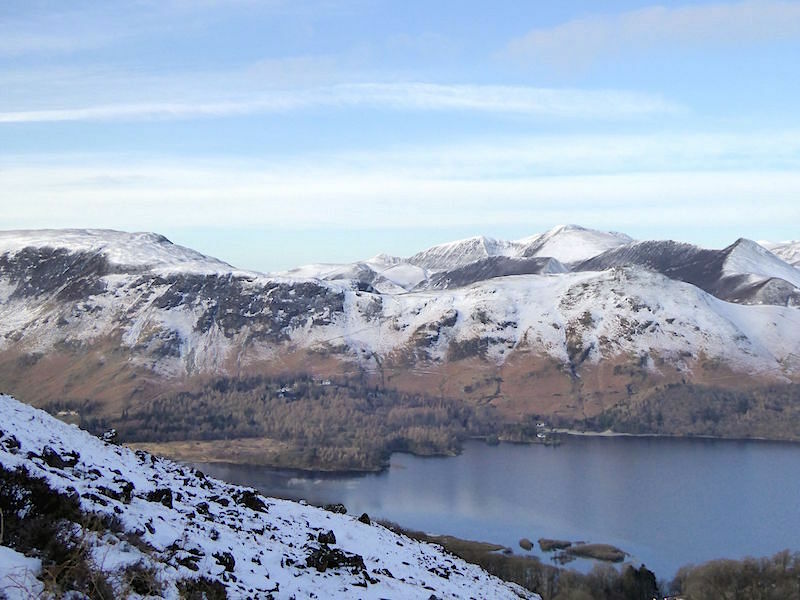 Still climbing higher above Derwentwater. We’re a good way from the car park now which is down there in the trees at the bottom right. 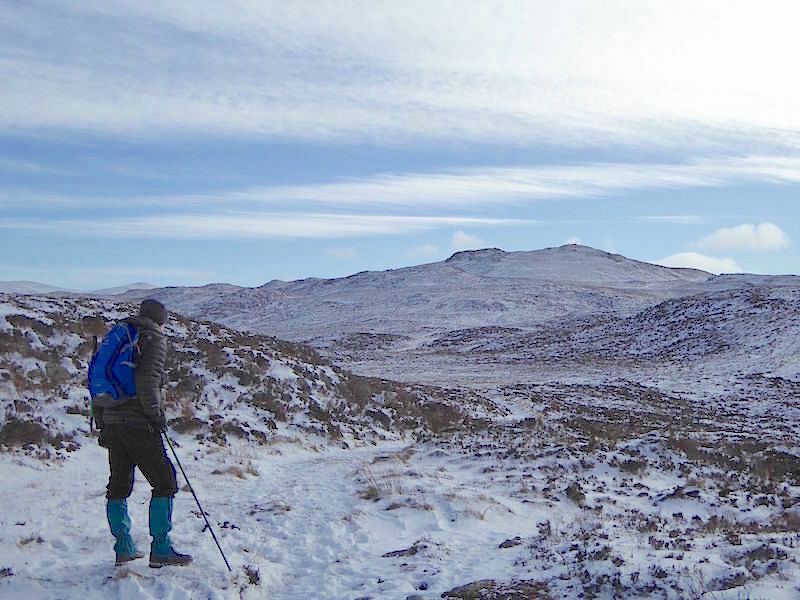 We’ve reached the snow line and the path is hidden under mounds of snow, so we just pick a line and go for it. That’s the technical term for making it up as you go along. 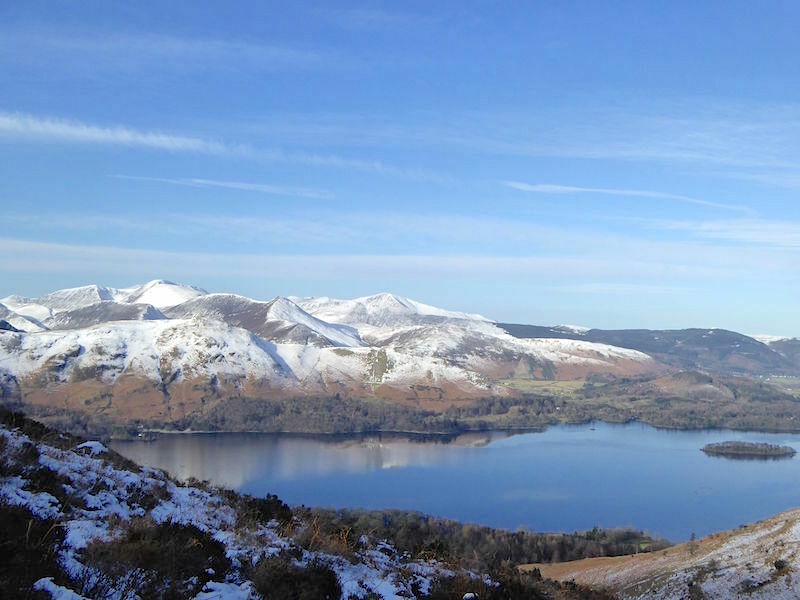 The hause between Maiden Moor on the left and Catbells on the right. 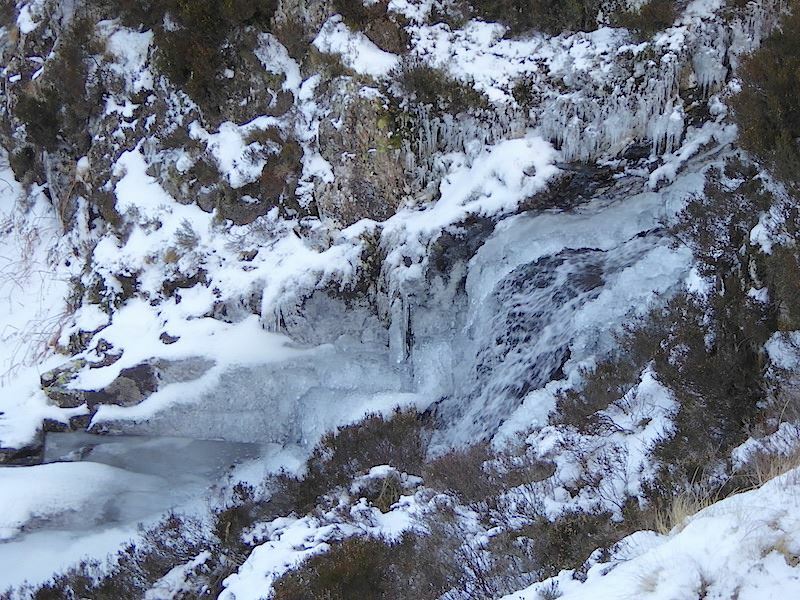 We’ve now reached the waterfalls in Ashness Beck and they’re almost completely frozen, just a trickle of water could be heard beneath the ice. 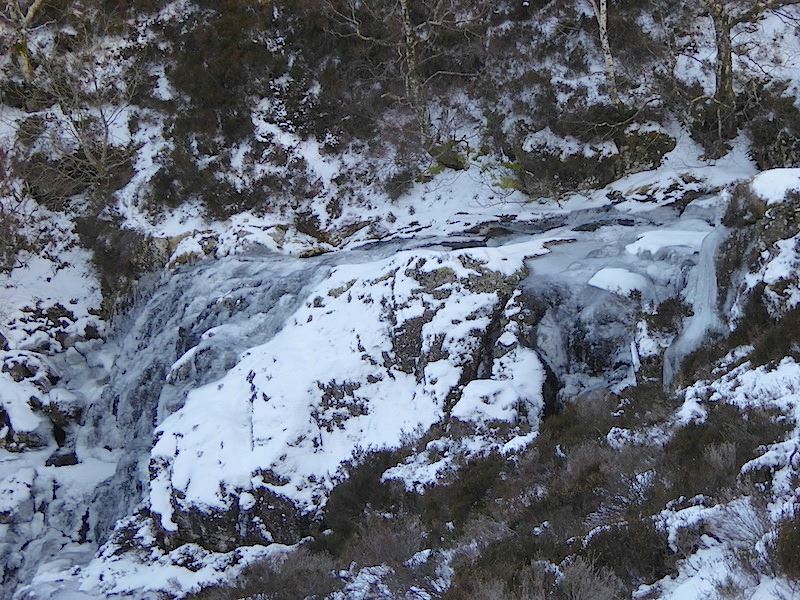 Its all a bit confusing so just concentrate on the icy light grey sections, that should be the water running over the falls. 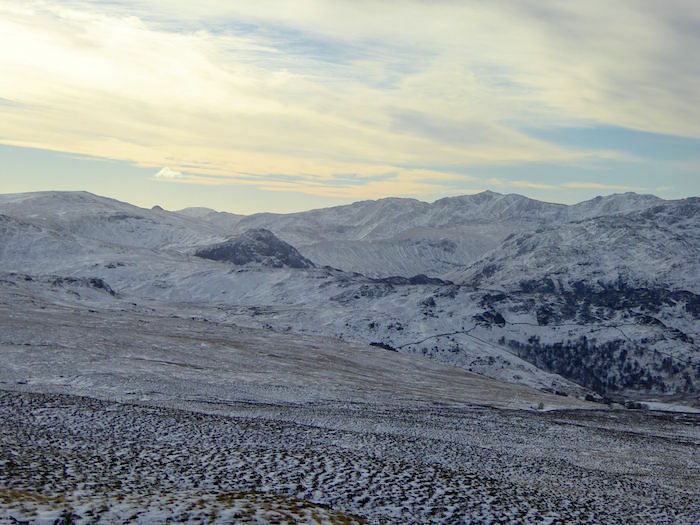 The brownish parts are clumps of heather, the roots of which have become expert at wrapping themselves around your boots and landing you face first into the snow. I expect you can work out for yourselves what the white bits are. 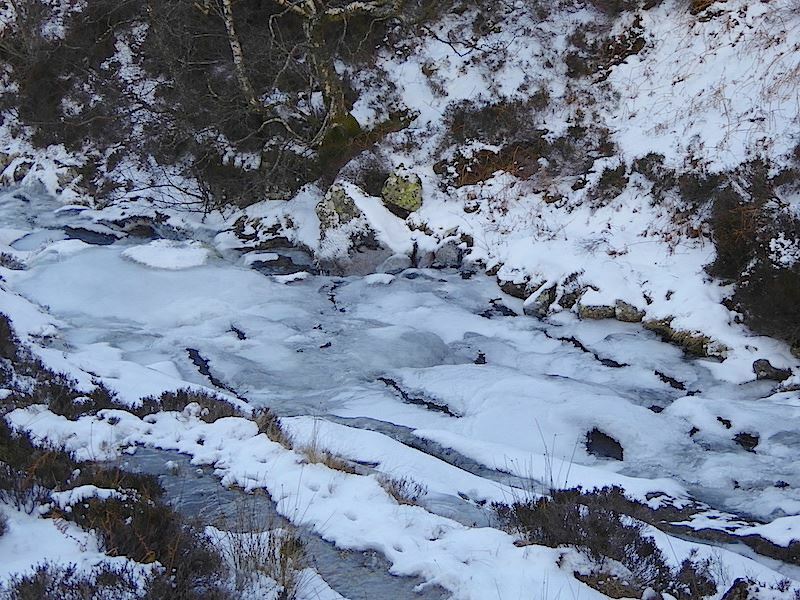 More of the big freeze in Ashness Beck. Below the falls there is solid ice where there should be running water. 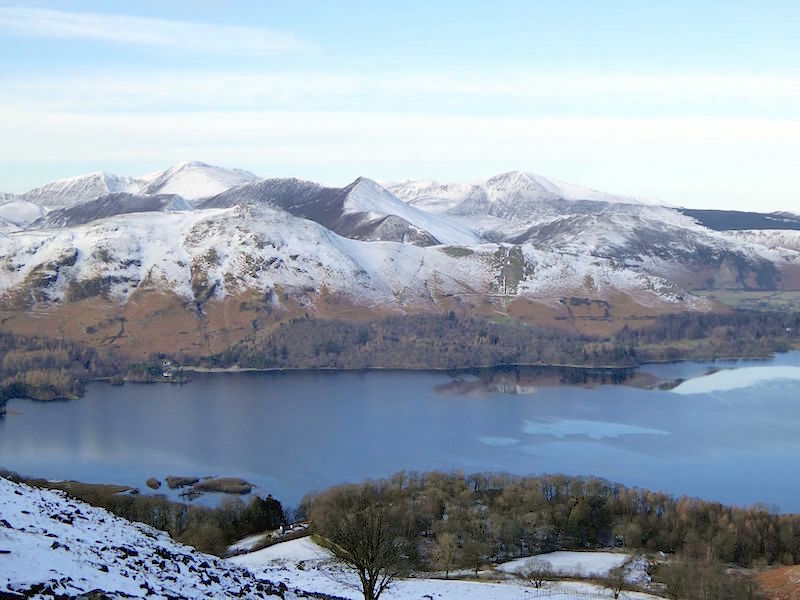 The north western fells beyond Derwentwater. 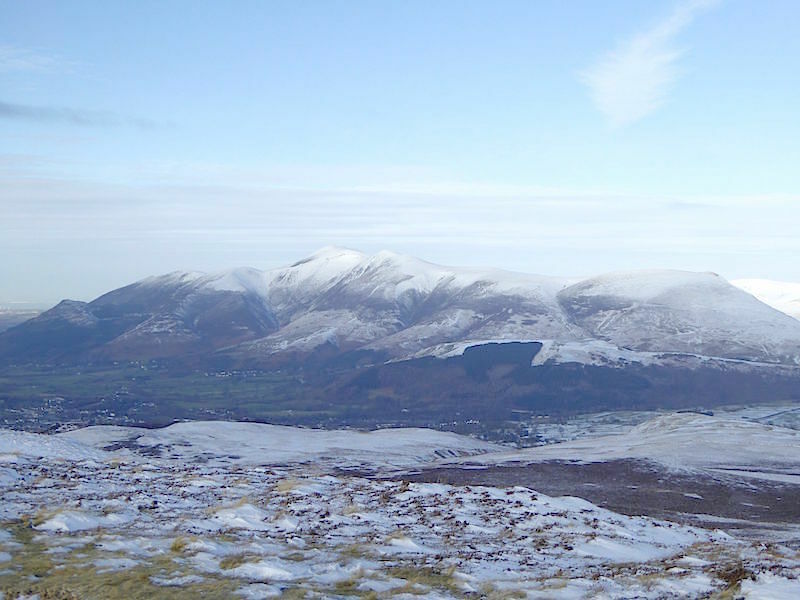 We’ve reached the little summit of Dodd and a view of Blencathra, in the centre, with Bleaberry Fell over to the right and someone tucking into a chocolate bar just below it. 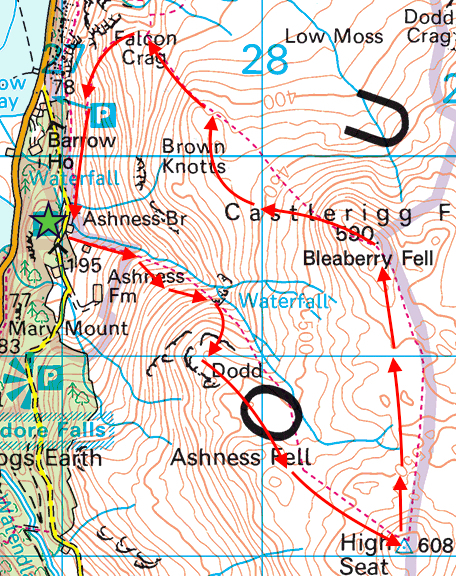 Mars Bar break over and we continue on up from Dodd. 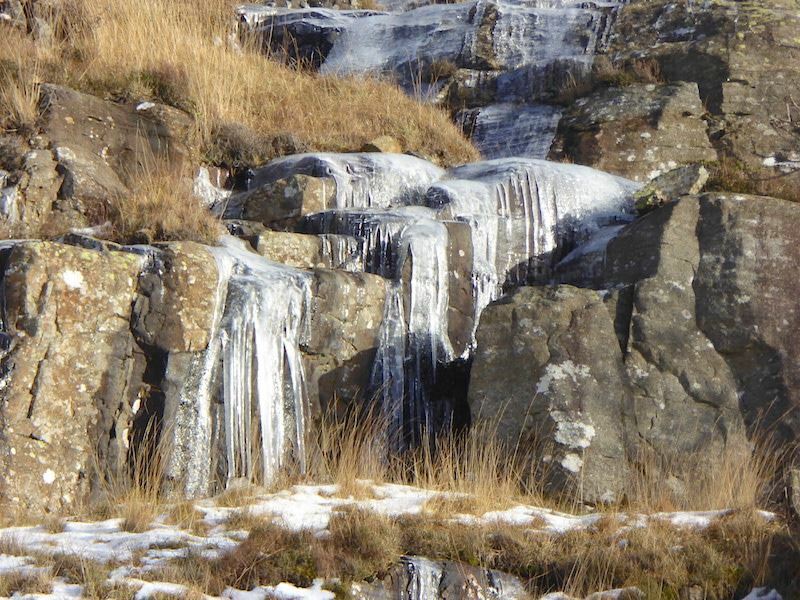 Here we’re looking over the frozen ground to High Seat. The sun has disappeared behind a large bank of cloud, so the photos will suffer. 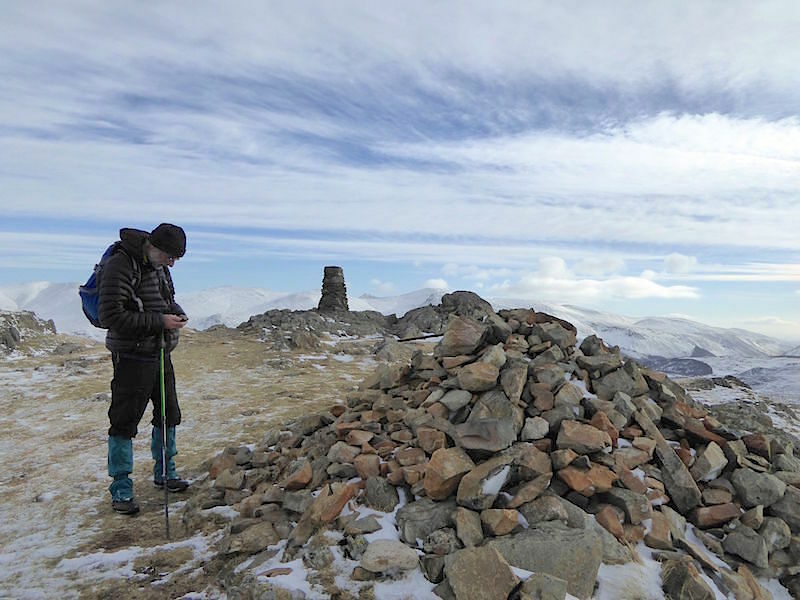 Checking the GPS on High Seat. I always wonder why since we always know where we are. 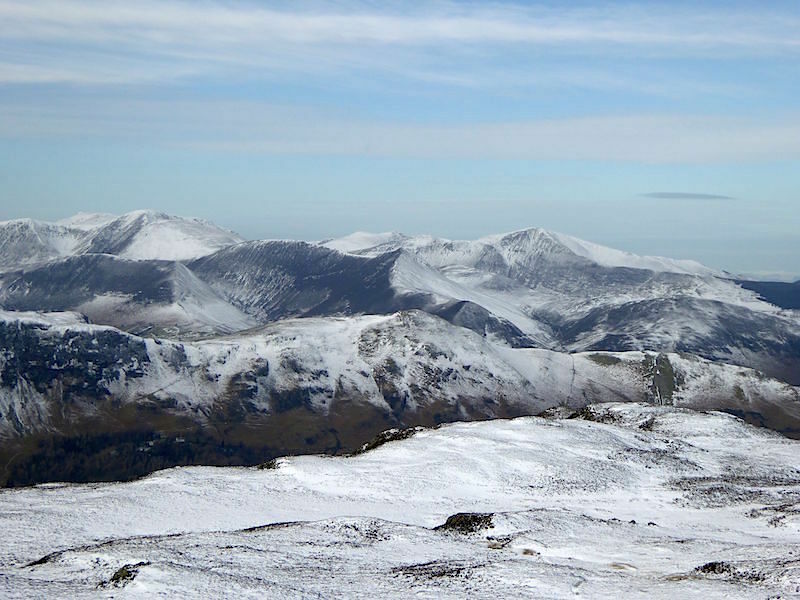 The north western fells from High Seat summit. 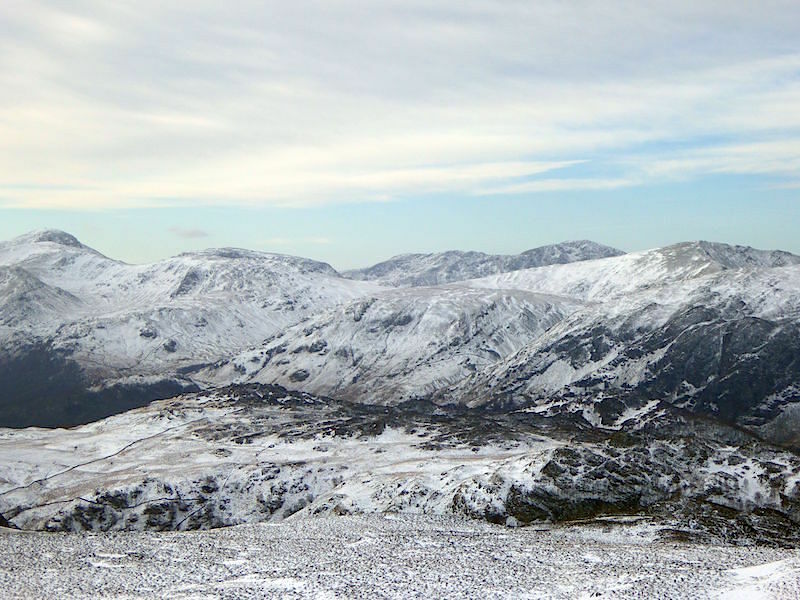 Moving slightly to my left with the camera to show more of the north western fells. 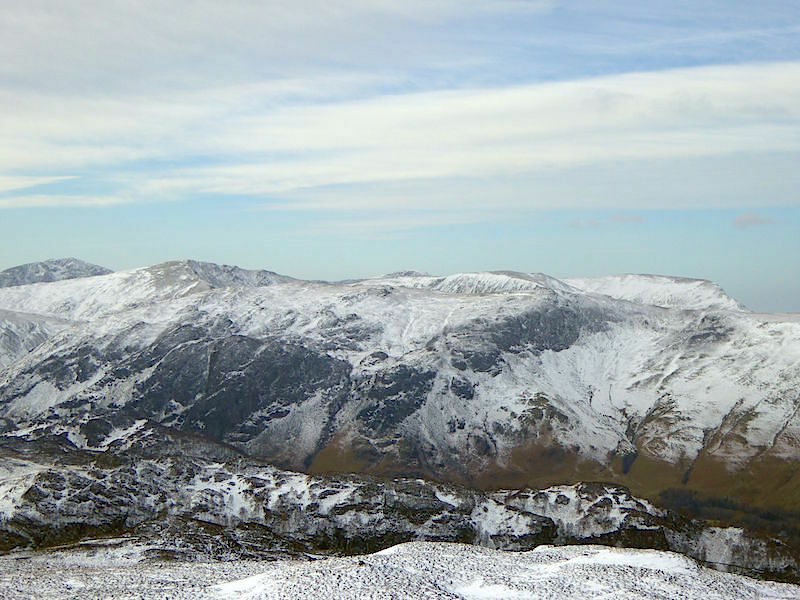 Further to my left again and on the extreme left Fleetwith Pike is just visible behind Dale Head. 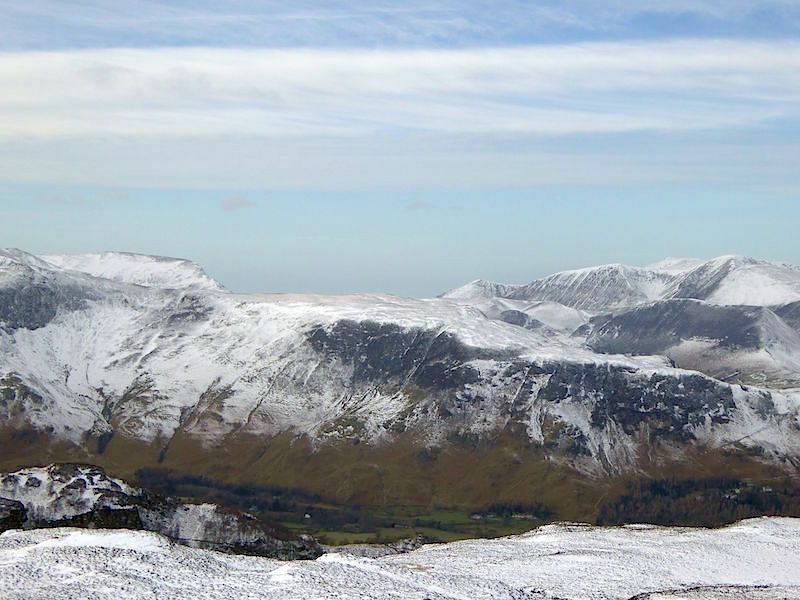 Further round to my left again and Dale Head and Fleetwith Pike are now on the right of the picture and Great Gable is on the extreme left. 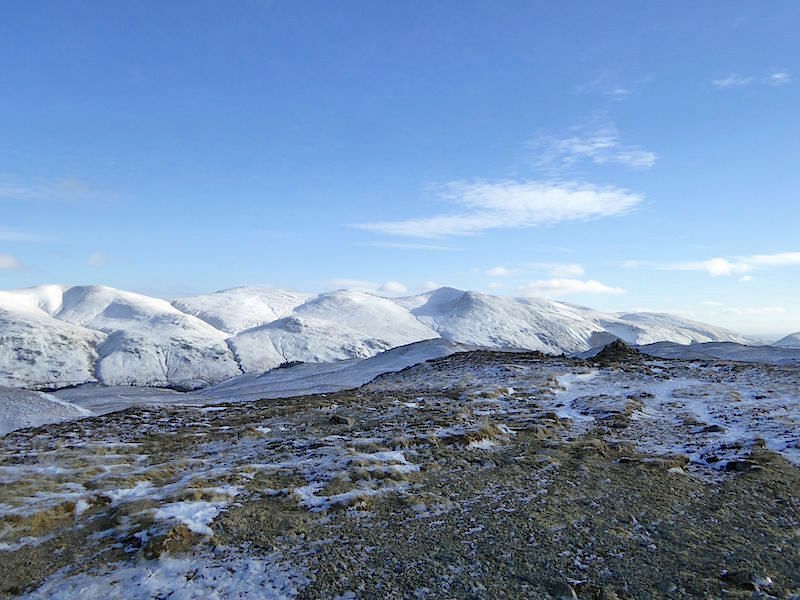 Still moving to my left and Great Gable is now on the right with a view of the western fells to the left. 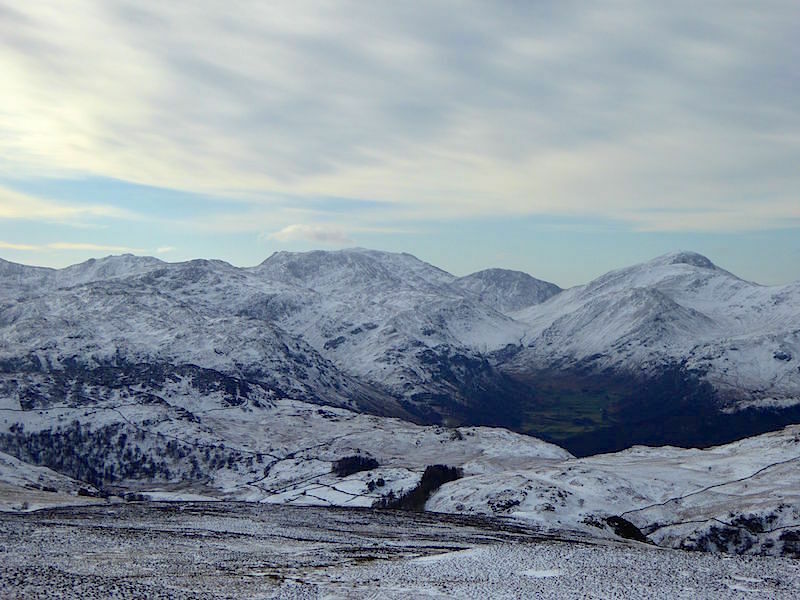 Looking over towards Bowfell, the one with the pointed peak on the right skyline. 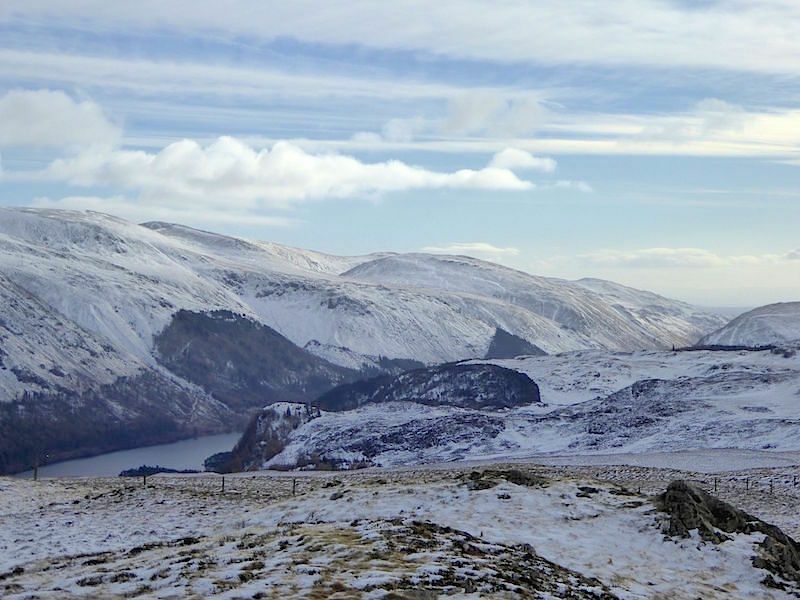 Looking across Thirlmere at the southern end of the Helvellyn range from HIgh Seat. 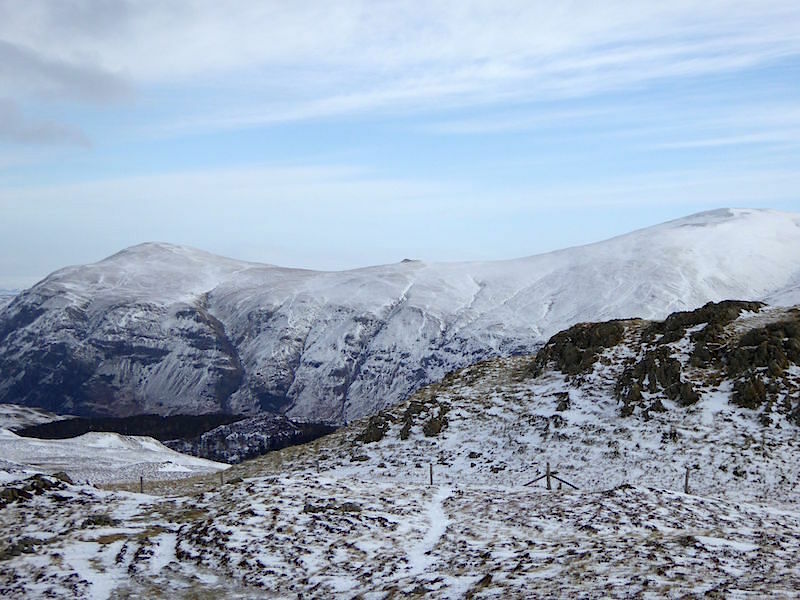 Left to right – Clough Head, Calfhow Pike and Great Dodd, I’d bet it was even colder up there than it was on High Seat. I’ve almost gone full circle and my fingers are numb so its time to get the gloves back on and get moving again. 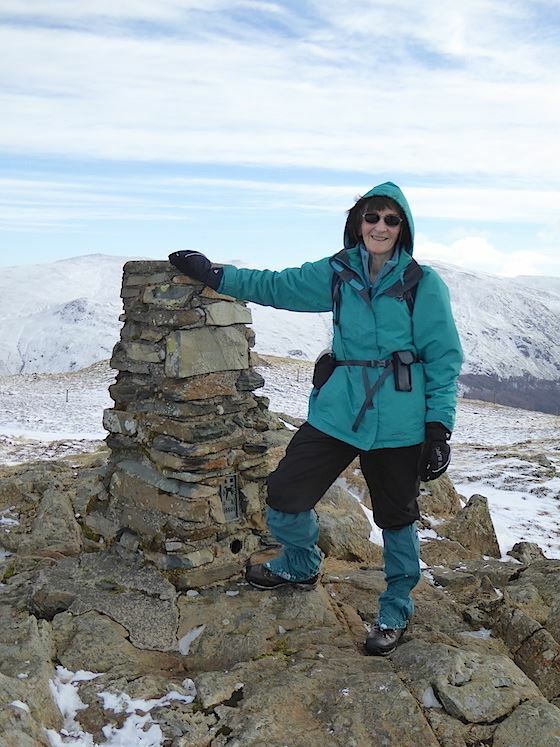 It was very, very windy on the summit of High Seat, come on let’s get going. 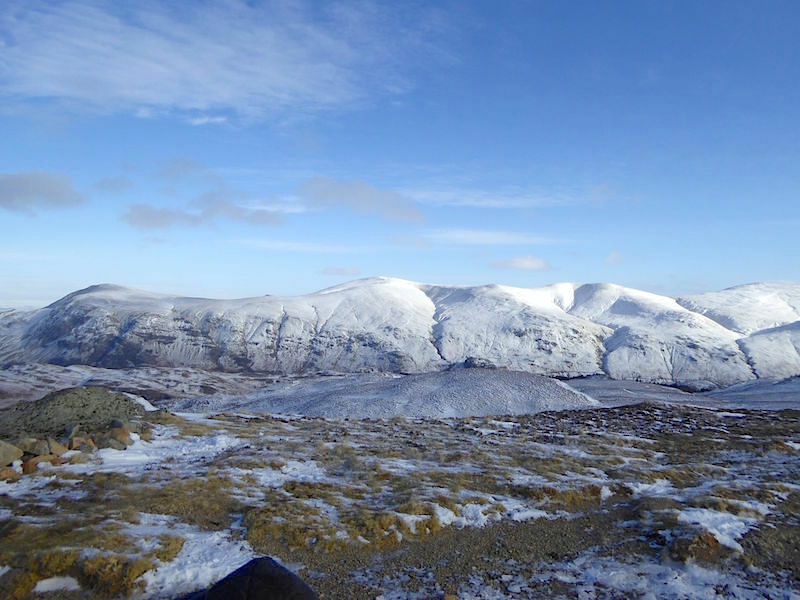 We came down from High Seat, into the very wet area between the two fells and then up to Bleaberry Fell. 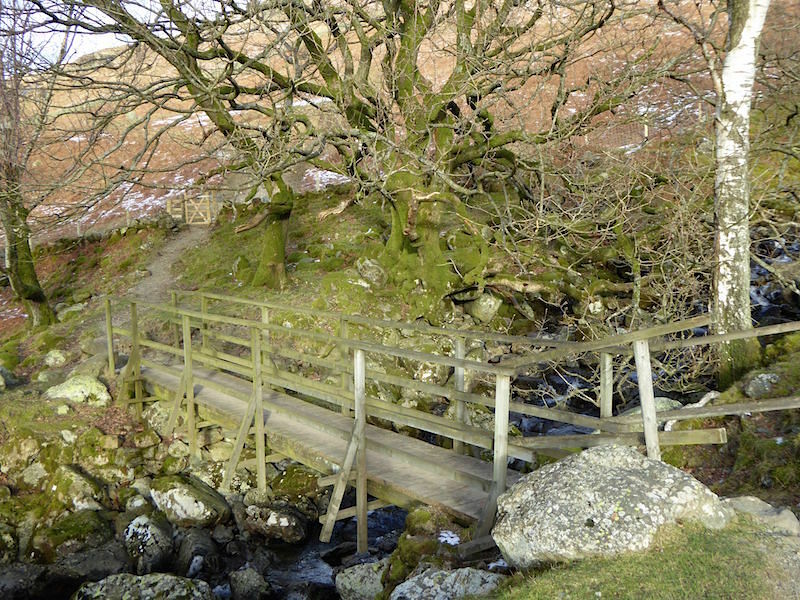 An interesting crossing where a small boat would have been quite useful at times. 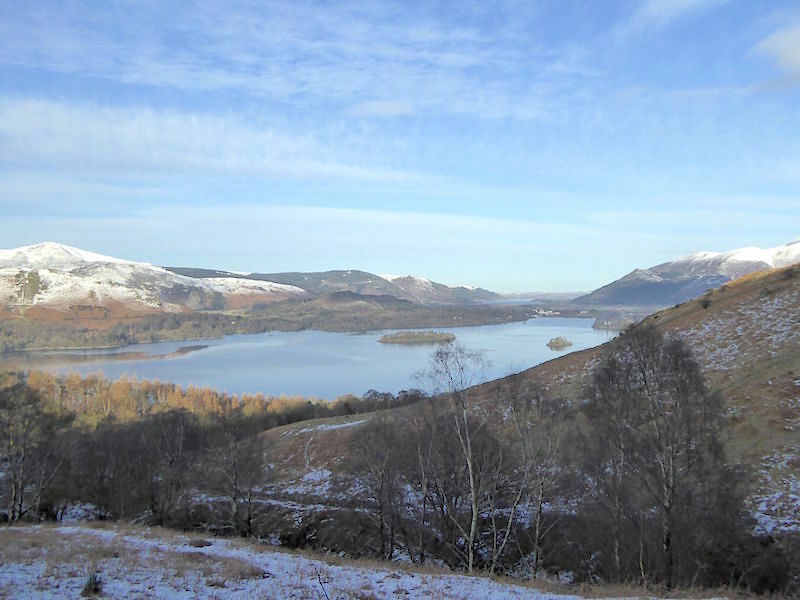 Large areas of water in the flattish area between, many of them covered by snow just waiting for the unwary, and where the path was we had no idea so it was back to the ‘make it up as you go along’ technique. Amazingly neither of us ended up with wet feet so we made it here onto Bleaberry none the worse for wear. 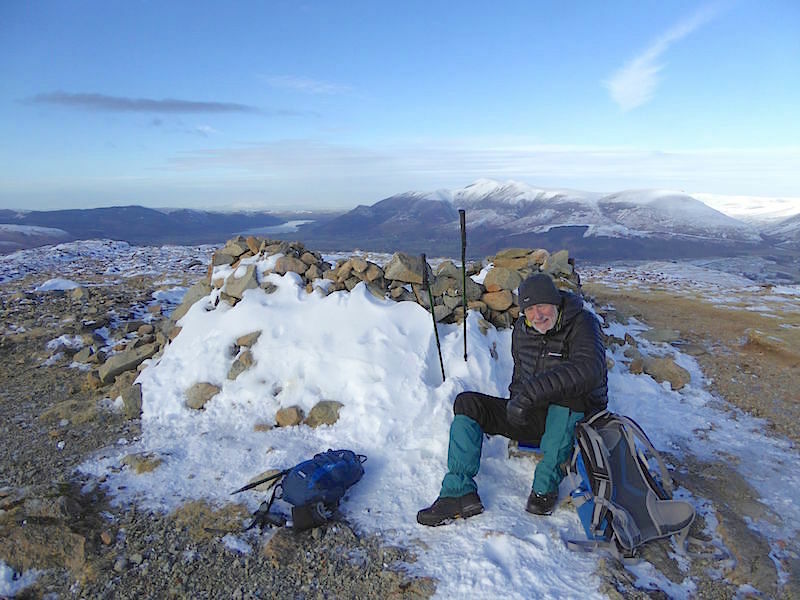 It was a return to strong wind up here and there’s nothing much by way of shelter.The cairn over there already had someone sheltering behind it so that left us with the wind shelter which is a few yards away behind me. 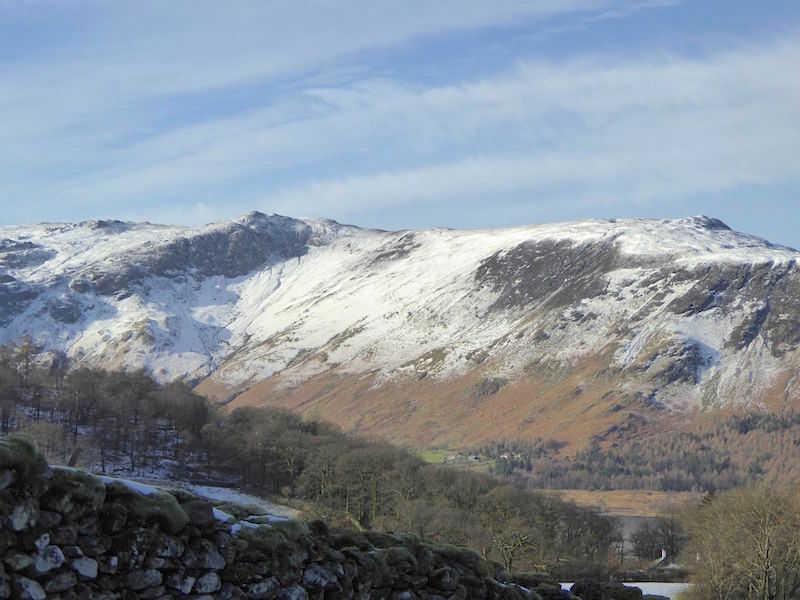 Before we walked over to it I took this shot of Helvellyn, the highest and partly shaded one in the centre, and its neighbouring fells. 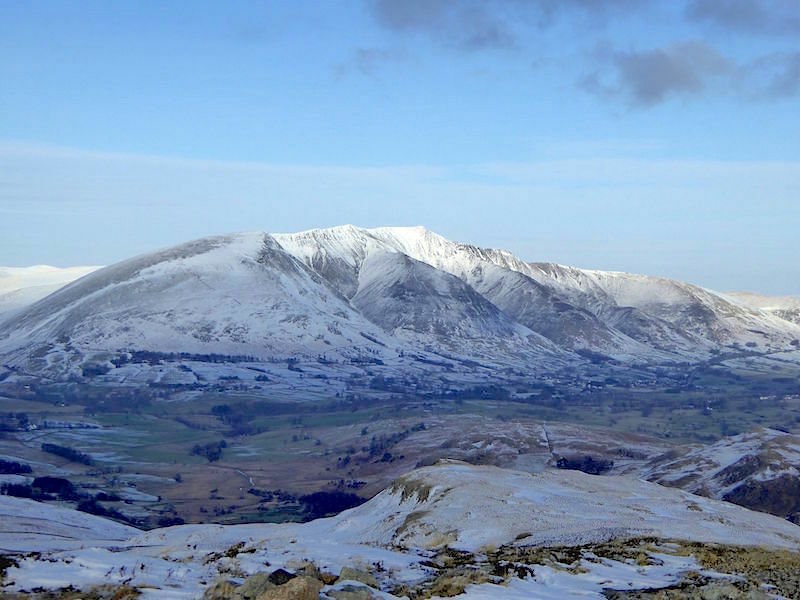 We have Clough Head and the Dodds on our right as we walk over to the shelter …..
….. and over to the right of us is Blencathra …..
….. and over to our left Skiddaw and its neighbours. 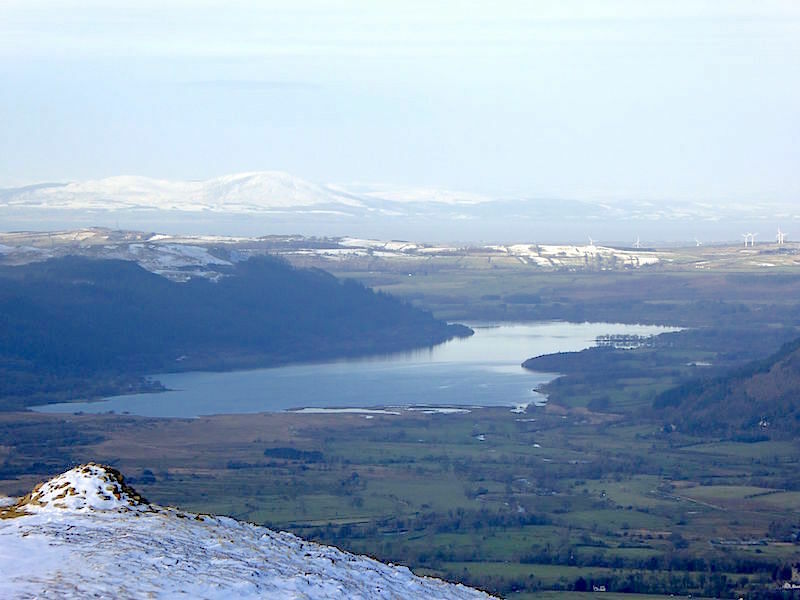 From Bleaberry Fell, a close up of Bass Lake and the snow covered Criffel, across the Solway Firth in Dumfries and Galloway. 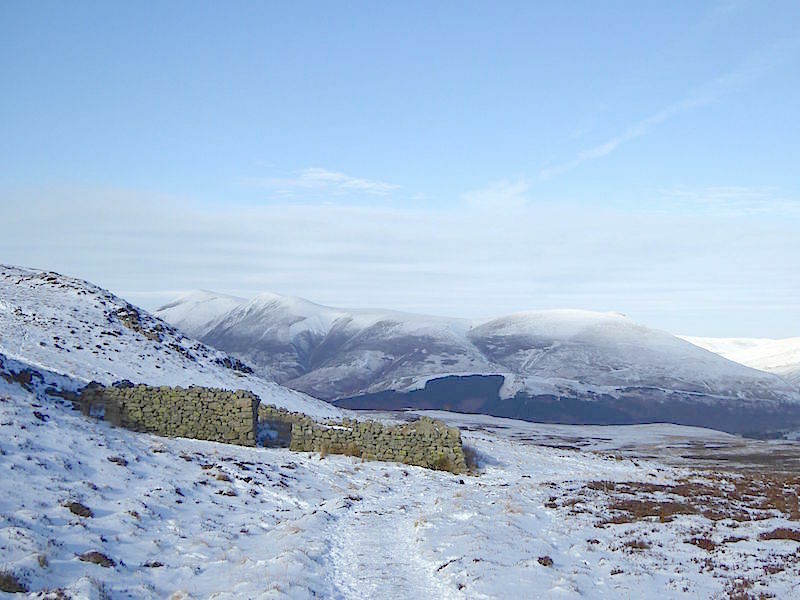 The shelter on Bleaberry Fell failed to live up to its billing as it was full of snow. We rather suspected it might be but hope springs eternal doesn’t it? Nothing for it them but to make our way off Bleaberry, at least we didn’t have any problems finding a path although it was very icy. Almost at the end of the walk and at last the cloud moved away. 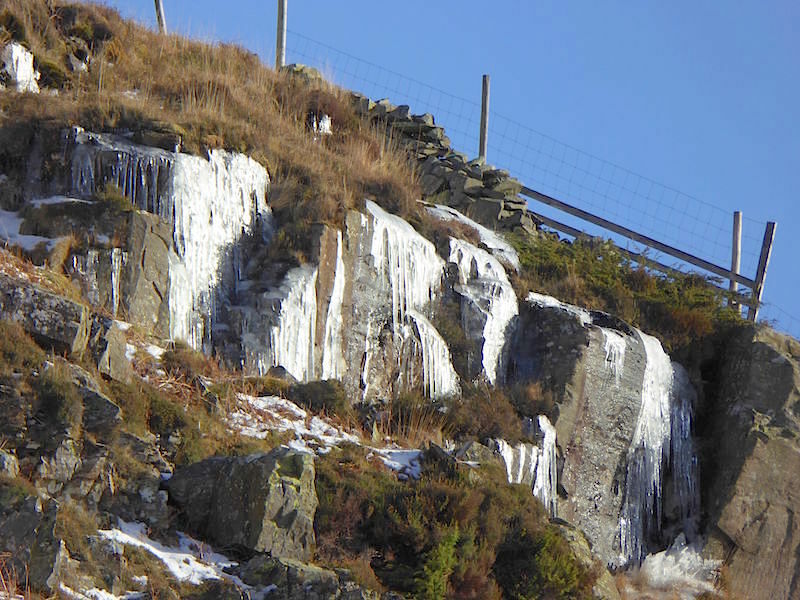 The burst of sunshine highlighted these icicles sparkling on the fell side above us as we made our way back to Ashness Bridge. 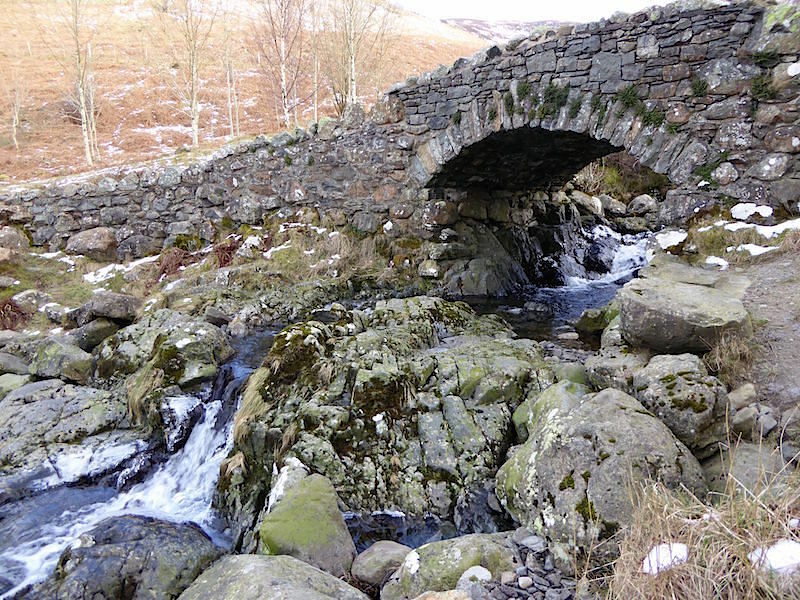 Crossing the footbridge over Ashness Beck and we’re now back on the same path we started out on four hours ago. 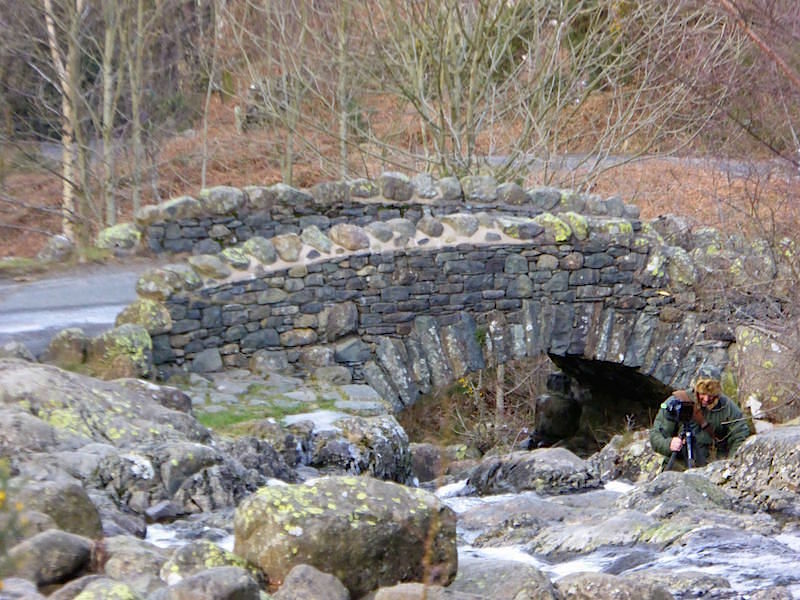 A photographer getting set up ready to take that perfect shot of the bridge. 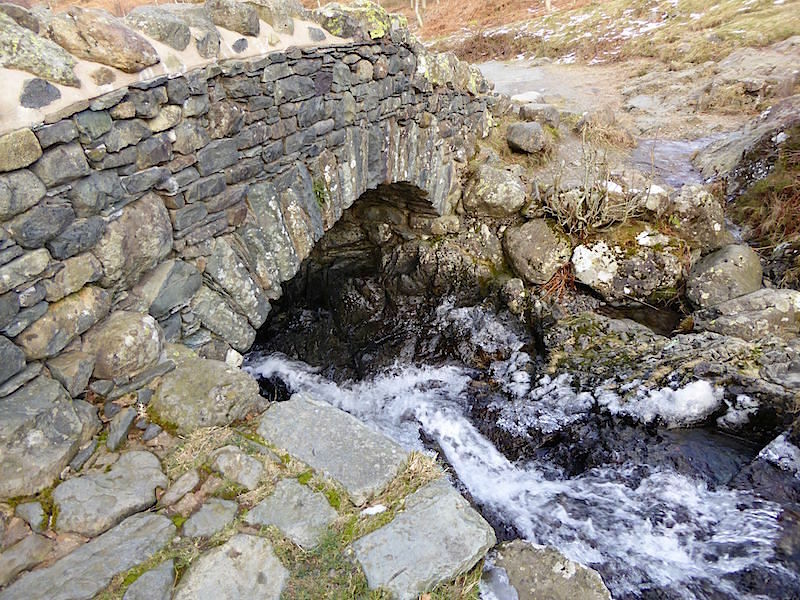 This must be the most photographed bridge in the Lake District. This is the view from below it …..
….. and the view from above it …..
….. and to finish, a close up of it.